This is the ultimate combination of wellness equipment at a great value. the Zen Pack has something for everyone: relaxation, meditation, massage and napping. High Quality that is soft, smooth and durable. Recline the EnergyPod to reduce pressure on the cardiac system with the elevation of the feet. 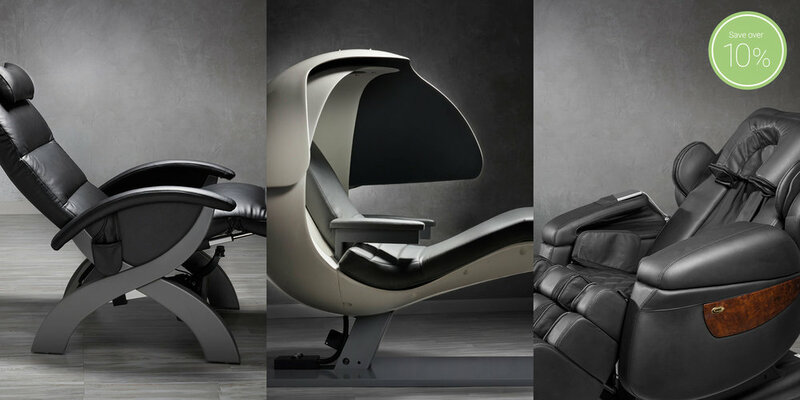 Our massage chair is one ingenious and comprehensive machine, one of the best in the industry. Simple to use, yet offering a depth of experience customization, this is an effective and durable solution. Most massage chairs aren't made for the hardship a workplace installation brings. The Clean Wipe Dispenser comes with enough wipes to keep your recliners clean for months! A waste bin is also available. Effective cleaning, yet safe for the equipment, the dispenser can be wall-mounted or come with a floor stand. Our in house designers will provide recommendations for layout. All of our equipment is backed by an extensive warranty. We offer rapid response by telephone and email. Your package comes with scheduled service visits to keep your installation at its best. Regular metrics to track usage (as applicable). Please contact us for example floor plans or a mockup of your facility. 3 standard power outlets required. * Prices do not include shipping, installation, sales tax and/or credit card surcharges if applicable. Please request a detailed quotation by providing your delivery zip code.